The car rolling over or flipping upside down is a horror film going live. It is something that belongs to the movies. There could be numerous reasons causing it like an animal jumping in front of the car or a car ahead suddenly slamming on its brakes. The flipping over is most common during the rainy season when the car is likely to lose control and spin and flip upside down. If ever you find yourself in such a situation, a natural reaction would be to panic and get terrified. However, tow truck service experts advise otherwise. They suggest you to follow the below mentioned tips at that time. It is natural that you would panic during a roll-over and feel as if you have stopped breathing. Asking you to remain calm in that situation is too tall a task. Still, you must remain as calm as possible because panicking will only take away your ability to think and judge which will add-on to the existing hazard. You need to get everything in your favor to survive. The calmer and focused you are while the vehicle is flipping, the more will be your chances to come out of it intact. When your car begins to tip and you realize that it’s going to tip over; your first instinct is to grip the steering wheel more tightly. What you do not realize is that the force of the impact will move from the tires to the steering wheel and cause you injury. Thus, in reality, you need to leave the steering wheel as well as release your legs from the pedals to prevent ankle breakage. The best position to brace for impact is to cross your arms over your chest and press yourself deep into the seat while using your legs to support yourself. Leaning forward will increase the probability of arm breaks and traumatic brain injury. Simultaneously, remain aware of your surroundings and steer clear of the roof just in case the frame of the vehicle has started to collapse onto you. Once the car is no longer rolling over, try to stabilize yourself by putting your feet against the floor and check for injuries. If you have passengers in the car, they should do the same. There could be broken glasses in your hair, blood tickling or any other injury which will not be immediately felt or noticed because of the traumatic incident. Any injured person should not be moved. The first thing you need to do is turn off the engine of the car and check out of you can make an exit. Turning off the engine will stop any possible fire due to gasoline leaks that are inevitable during the accident. Now you need to exit the vehicle as fast as you can especially if you see flames. In case you are uninjured, reach towards the ceiling with one hand for support and stabilizing your feet, undo the seat belt. You need to be extra careful as this is the phase when maximum injuries occur. Check if the door can be unlocked and opened free or if you can break a window and escape from there. Be careful of any glass shards or debris. Once you are out, try to get the passengers out of the car and move as much away from the vehicle as possible, just in case a fire breaks out. In case anybody is seriously injured and needs immediate medical attention, call 9-1-1. In case there is no medical emergency, you can start taking pictures as proof of what has happened. These pictures would prove crucial when you are trying to claim insurance and even for attorney in case it is required. They would help you build your case solidly. 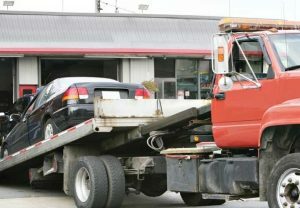 Once you have made a call to the necessary authorities, you should call to your tow truck service that you must have booked beforehand so that you can receive the require help. Most tow truck services specialize in such mishaps like lockouts, driving hazards, tire changes etc. Getting their services would be the perfect savior.